This is a chart for the nuclear deal just signed with Iran and six other nations this morning in Geneva. It freezes parts of Iran's nuclear program in exchange for a partial lifting of sanctions. It has Israel and the neoconservatives furious, because it moves the region away from the possibility of open warfare toward peace. Iran, for all its numerous faults, is a fundamentally non-aggressive nation. Libertarians and peaceniks who are paying attention know that the brouhaha over Iran as a "threat" is an Israeli/neoconservative tactic to pressure America into another quagmire of war. The chart is complex and somewhat conflicted. It has a full trifecta of authoritarian/pro-war factors: Pallas square Pluto, semisquare Jupiter, and trine the South Node. However, the Sun is moving into a square with Pallas, and Mercury which rules Pallas is both conjunct and very tightly parallel with the North Node. The peacenik/libertarian factor wins, but the victory is uneasy. The fact that the governments of the world have not made major authoritarian moves lately also reflects this pattern. 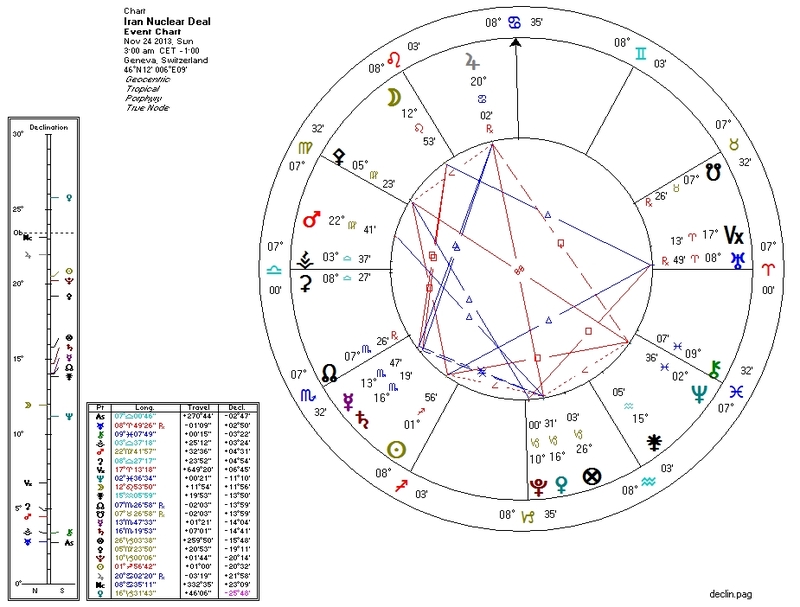 The North Node is dead-on the Second House cusp, which probably nullifies the tentative Bloodbath Formula that otherwise exists on the chart (Pallas with compromising aspects, Pluto connections to Sun and Venus, and Neptune semisquare Venus). This bodes well in that it joins with the Pallas/Mercury/North-Node pattern to suggest that the deal will not somehow turn into another twisted justification for a new war. Jupiter in Cancer (perhaps reflecting public sentiment as well as the "benevolent" side of authority?) is prominent in the Tenth House of governmental authority, and is the focus of a weak sesquiquadrate-yod (or "Thor's Hammer") between the Sun and Neptune. This is perhaps a hopeful configuration suggesting a manifestation of humanity's desire for peace -- but Neptune suggests not only hopes and dreams but unseen dealings and deception. Themes of communication are also prominent. The elevated Jupiter rules the Third House of communication. The North-Node/Mercury/Saturn triple-parallel-conjunction in the Second House suggests a hopeful (North Node) dialogue (Mercury) between authorities (Saturn) regarding tangible assets (the Second House). Jupiter also forms an opposition with Pluto and Venus which sit at the IC. This is fairly literal: Jupiter (the "royalty", as it were) in negotiation with opposing parties (the Fourth House) regarding nuclear power (Pluto) and economics (Venus). Uranus on the Descendant trine the Moon in the Eleventh House gives us a picture of an unexpected shift in relations (Uranus on the Descendant) which is of benefit to the public (the Moon in the Eleventh). Chiron on the Sixth House cusp (trine the Sun) suggests repair or healing (Chiron) of processes and working structures (the Sixth House). This deal is uncharacteristic of the current administration, which until recently has chosen war and tyranny at every opportunity. Perhaps it is a symptom of a need to placate the faction of its Left-liberal support base that actually desires peace, or a "bone" thrown to the public in the face of the spectacularly epic failure of Obamacare. More such moves by this otherwise nasty administration are naturally welcomed, albeit suspiciously. Write to me at "alan" + "@" + "zot.net".